As the 2015 E3® Expo approaches, we can’t wait to be blown away by what the video and computer gaming industry’s most innovative companies have in store. Whatever your passion, E3 is sure to provide a preview into the next incredible crop of games and revolutionary products. Not to mention there’s always bound to be a few game-changing surprise announcements that pop up during the event. It truly is the high point of the industry’s year and a treat for any gaming enthusiast – even if you’re a noob. In particular, we can’t wait to check out the mobile gaming accessories that Mad Catz® is bringing to the show. As you know, we love our smartphones – especially how they allow us to bring our favorite mobile games anywhere. But don’t you get tired of having to swipe, tilt and tap on a small screen, longing for that console experience? As gaming technology continues to become more sophisticated and graphically demanding, even mobile games are engaging enough to deserve the more immersive experience of a bigger screen. With MHL and Mad Catz we have you covered. MHL technology allows you to connect your smartphone to a TV and play all of your favorite games with no lag. 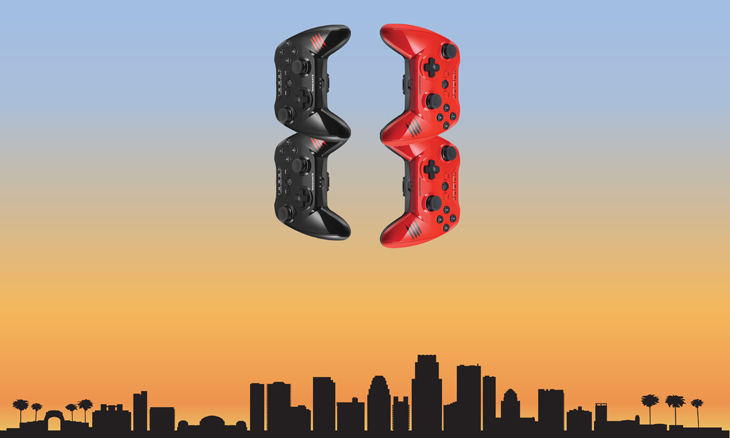 Pair a game controller or accessory from Mad Catz to take your game play to a whole new level! With a streamlined industrial design and ergonomically sculpted form, the Mad Catz L.Y.N.X. 3 and L.Y.N.X. 9 hybrid controllers offer the same feel as a console controller, allowing you to get the precision necessary to dominate any game. You can head to the Mad Catz kiosk (South Hall - 2823) to get your hands on the L.Y.N.X. controllers, as well as a full array of keyboards, headphones and gaming mice that can effectively turn any Android device into a console. With MHL and Mad Catz, your phone turns into something much more than a smartphone – it’s an all-in-one console. But that’s not all. Our inner rock stars are psyched to get a chance to try the new Rock Band accessories that will be on display during a June 16 preview party. Whether you prefer to shred on the guitar like Jimi Hendrix, bang on the drums like Neil Peart or hit the high notes on lead vocals like Freddie Mercury, the Mad Catz craft accessories and the first new Rock Band from Harmonix® since 2008 surely won’t disappoint. If you can’t make it to the party, stop by the Mad Catz mobile kiosk (South hall – 2823) and take your pic with an MHL guitar pick! Unlike Seattle’s PAX Prime show, which is open to the public, E3 is only open to industry insiders. However, we’ll be live tweeting right from the Los Angeles Convention Center floor on Wednesday, June 17 to make sure you get to see all of the cool new products coming out from our Adopters and partners, including Mad Catz, Snail Games USA® and Nyko Tech®. If you’re worried you’ll be AFK during the show, follow us Facebook, Twitter, and Instagram to get live updates throughout the show!